It’s also home to a network of money-saving mavens whose specialties range from creating upcycled lightbulb wildflower planters to good ol’ fashioned couponing. Check out six Instagram accounts (other than our own) that can teach you a few things about saving and spending money wisely. Mima creates original plates, but also shares others’ recipes. The best part: She puts the ingredients and instructions right in the photo description. No extra clicking or searching required! Not only does this look delicious, it’s also inexpensive to make: the chicken breasts are the priciest ingredient at around $4.30 per pound. As a broke college student, I frequently “Chopped challenged” (against myself) out of necessity. LFHW (Love Food Hate Waste) has a similar feel: use what you have. It’s not necessarily a visually original account — most of its photos seem to be stock or used with permission — but it does publish unique branded graphics. The UK-based account’s bio states that it helps followers “Keep more food out of the bin with food-saving tips and leftover recipes.” (Note: UK “bin” = US “trash can.”) The account is equally committed to helping save the world and your wallet. Who doesn’t enjoy a good bit of trivia? Impress your friends with your Norwegian conservation knowledge while figuring out what to do with that leftover ground beef in your fridge. Find the recipe at the short URL in the post. From useful organization techniques to beautiful art pieces that will knock your darned-with-leftover-gift-wrapping-ribbon socks off, the folks at Upcycle do exactly what you think they would. And they do it well. It’s quite inspiring to see one-of-a-kind pieces — created at next to no cost — that big box stores are now trying to emulate aesthetically. Bonus: They provide tutorials for your DIY pleasure. Did someone say free palletes? Gail at My Repurposed Life is the epitome of an upcycle-driven DIYer. Her account is ripe for Pinterest pickings, as she includes both decorative and useful projects in her feed. You’ll find information on repurposing otherwise-disposable goods to create items such as serving trays, benches, coffee stations (yes, please! ), lamps and lighting fixtures, shelving and so much more. She also provides tutorials for every single project that she documents on her account, so making the leap from idea to reality is one step closer for her followers. This multi-use cabinet is created entirely out of repurposed and reclaimed wood. As mentioned in her post, builders could use new lumber… but where’s the fun in that? The gathering and assembling of unique pieces is what makes projects like this awesomely eco- and wallet-friendly. Free Stuff Finder is an Instagram account dedicated to — wait for it — helping you find free (and discounted) stuff. It’s insanely on-the-ball and appears to post in real-time. Its 446K followers are probably just as impressed as I am with their dedication to discounts. The posts aren’t pretty, per se, but they’re incredibly useful for those looking to score some high-end haul on the cheap. Gift cards, baby clothes, cookware… this account has got it all. 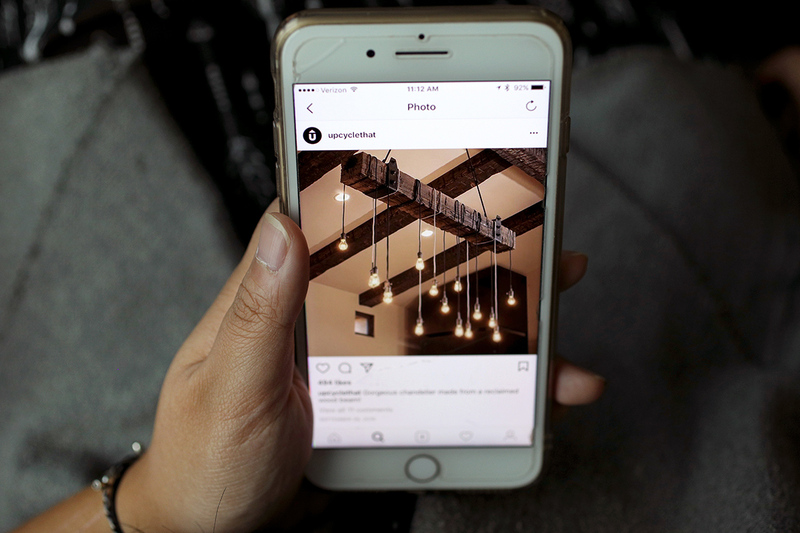 Similarly to Instagram, its website’s branded images are also in grid format, so toggling between the two is user-friendly. You can get a brand new HD wide-angle waterproof camera for less than a quarter of its retail price. If that’s not reason enough to love this post, I don’t know what is. Mommy Of One, as she calls herself, provides her 78.3K followers with coupons and sales alerts on a multiple-times-daily basis. Her feed is especially beneficial for those living in the Southeast, as many of her posts include Publix deals. From food staples to pet products, beauty tools to baby clothes, this couponer’s account runs the gamut of retail-related savings. Not only does @sophiecoupons share deals from Publix, CVS, Target and more, she also explains how to get the most bang for your buck by combining coupons with BOGOs. And she tells you where to find the coupons. She’s essentially your money-saving fairy godmother and proves — in every post — to be very generous to her followers. In addition to hashtags, if you’re interested in a specific money vertical (say, couponing), start by following one account and then pay attention to the profiles they tag in their posts. It will start a chain reaction that will inevitably lead you down an Instagram rabbit hole, and you might end up buying 35 bottles of dish soap for $3.99at 4 a.m. Because, you know, coupons. Court Bishop (@mightybishop) is an avid Publix BOGOer and rarely buys anything for full price. She doesn’t take all that many selfies either, so that’s thoughtful of her.